Carly (Laura Wright) and Sonny (Maurice Bernard) were surprised to see Ava (Maura West) at The Metro Court talking with Lucy (Lynn Herring). Ms. Coe couldn’t believe Kevin (Jon Lindstrom) dumped Laura (Genie Francis) for Ava and commented how Ms. Jerome never really knew “Doc.” Watching the scene, Curtis (Donnell Turner) and Laura laughed at who would win if things got physical. Kim (Tamara Braun) told Elizabeth (Rebecca Herbst) how worried she was because Oscar (Garrett Stitt) hadn’t texted her. Meanwhile, Oscar and Josslyn (Eden McCoy) were trying to figure a way into the catacombs. Anna (Finola Hughes) and Finn (Michael Easton) talked about how she could have gotten the virus. Finn told her the virus could have been in her system weeks, months or years. Anna wondered what could have triggered it and caused her temporary blindness. Michael (Chad Duell) gave Lucas (Ryan Carnes) a check, telling him he set up a college fund for Wiley. Chase (Josh Swickward) brought Willow (Katelyn MacMullen) back to his place so they could eat dinner away from the book launch crowd. Willow confessed she gave her son up for adoption. Lulu (Emme Rylan) let “Kevin” into her office to ask him about the number of Ryan’s victims. He told her there were nine with two unsolved. After taking her driver’s license, Ryan taunted Lulu how she was missing what was right in front of her. Lulu reasoned “Kevin” was thinking he was Ryan, but pulling out his knife, Ryan asked her who he was. When next we see them, Ryan is cleaning off his knife and Lulu struggled to get up. She makes it to the door. Ryan tried to stop her but suddenly passed out. A bloody Lulu came off the elevator at The Metro Court dining room and collapsed at Laura’s feet. Lucas provided medical attention and Ms. Falconieri was rushed to GH. Later, Ava and Carly helped Ryan off the elevator and he told them he couldn’t see. Curtis and Jordan (Briana Henry) investigated the crime scene and discovered the killer left behind evidence…a bloody shoe print. Ryan asked Ava to check on Lulu’s condition. Ava offered to take “Kevin’s” shoes home and bring back his slippers. As he and Josslyn were about to go home, Oscar experienced a seizure. Chase (Josh Swickard) gave Drew (Billy Miller) and Carly (Laura Wright) an update of missing teens Oscar (Garren Stitt) and Josslyn (Eden McCoy). Carly explained that Cameron Webber (Will Lipton) told her the teens wanted to explore the catacombs but that was hours ago. Meanwhile, Josslyn cradled Oscar’s head in her lap as he regained consciousness. Sam (Kelly Monaco) and Jason (Steve Burton) were at Kelly’s discussing Shiloh (Coby Ryan McLaughlin) when Carly called and told Jason she needed him. When Sam and Jason arrived, Carly filled them in. Oscar encouraged Josslyn to climb the ladder and go get help. He reminded that they couldn’t stay there all night in the cold because they’d risk hypothermia. Although she wasn’t sure if she should do it, Josslyn climbed the ladder. Unfortunately, she fell off to the floor. At Kelly’s, Alexis (Nancy Grahan) introduced herself to Shiloh, who told her his life story including how he his father’s trophy wife Cheryl Richardson (Sam) cleaned out his (Shiloh) inheritance. Shiloh continued explaining how Drew’s saved his life in Afghanistan, which caused him to take stock on how he was living it and made him turn his life around. Sam, Drew, Carly and Jason found Oscar and Josslyn. Carly assured her daughter they were going to get them out. Lucas (Ryan Carnes) was angry when he arrived with Michael (Chad Duell) at Charlie’s Pub and saw Julian (William deVry) holding Wiley. Lucas asked Michael to take Wiley while he hashed things out with Brad, reminding he (Lucas) didn’t want Julian anywhere near Wiley. After Brad and Lucas left the pub, Michael reminded Julian that his past deeds were the reason he couldn’t be a part of his grandson’s life. Willow entered and was emotional upon seeing Michael holding Wiley (who she believes is her son). Shiloh told Alexis about the seminar and how it helped Kristina (Lexi Ainsworth). Drew and Jason climbed down to Oscar and Josslyn. Jason noticed the floor was able to give in but kept that information to himself. Drew helped Oscar climb the ladder. Before his father took him to the General Hospital, Oscar hollered down to Josslyn that he loved her. Jason told Josslyn to go next and he would catch her if she fell off the rickety ladder again. Once Josslyn was topside, Carly asked her daughter whether Josslyn hit her head when she fell. Although Josslyn assured she was okay, Carly wasn’t taking any chances and told her daughter she wanted her checked out at the hospital. Sam promised to wait with Jason for the fire department’s arrival and assured Carly she’d call her once Jason was out. Once Carly and Josslyn were gone, Jason told Sam he couldn’t wait for the fire department. He explained to Sam that the floor was about to give way and he didn’t have much time to get out. Jason began climbing the unstable ladder. Sam reached out her hand to help him up. But the ladder fell and with it Jason. At General Hospital, Jordan (Briana Henry) gave Laura (Genie Francis) and Sonny (Maurice Benard) an update into the investigation into Lulu’s (Emme Rylan) by the serial killer. Jordan told Mayor Webber she’ll provide a more detailed report upon her return to her office. Jordan asked Laura how she should respond to the press. Anna (Finola Hughes) and Finn (Michael Easton) wondered whether “Kevin” (Jon Lindstrom) contracted the same virus Anna had. Meanwhile, Ryan had a dream Lulu was dead but Ava (Maura West) assured that although Lulu (Emme Rylan) could eventually succumb to her injuries she was holding on for the time being. Valentin (James Patrick Stuart) told Charlotte (Scarlett Fernandez) that her mother was in the hospital. Charlotte wanted to see Lulu saying her mother needed her. Sam (Kelly Monaco) called out for Jason (Steve Burton), but she couldn’t see him as he was now further down. Jason regained consciousness and searched for a way out. Sam searched for something to use as a rope to climb down. The fire department arrived. She updated the fireman on the situation. Then, she called Spinelli (Bradford Anderson) and asked him to get plans of the city to find pipes underneath the city. Jordan continued to brief Mayor Webber after Sonny left them alone. Commissioner Ashford told Laura about Lulu’s driver’s license being missing, the knife left at the scene and the bloody footprint that appeared to belong to a man. Anna and Finn entered “Kevin’s” hospital room. After telling him about the virus that caused her blindness, Anna questioned “Kevin” about whether he ever worked for the DVX or WSB. Finn told “Kevin” once they get his lab tests back, they’ll have answers. As it was their anniversary, Maxie (Kirsten Storms) visited Nathan’s (Ryan Paevey) grave and updated him on the Yankees’ season. After telling him how much she loved and missed him, Maxie asked him how she could think about moving on. Peter (Wes Ramsey) arrived and they talked until interrupted by Nina (Michelle Stafford), who broke the news about Lulu being attacked. Jordan had Lulu’s cell phone accessed and wanted to question Peter as he was the last person Ms. Falconieri spoke with. Anna assured Laura that Peter had nothing to do with Lulu’s attack. Valentin brought Charlotte to General Hospital and Laura promised her granddaughter Lulu was strong and a fighter. When Maxie and Peter arrived, Jordan wanted to take August down to the PCPD to answer some questions but decided to ask him there in the hospital about his phone call with Lulu. Peter explained that his call with Lulu was to telling her he was pulling her Ryan Chamberlain story, which didn’t make her happy. Ryan attempted to retrieve Lulu’s driver’s license from his wallet in his coat pocket. He was interrupted by Ava and lied he was looking for the remote to turn on the television. Finn entered with his test result and told Kevin he contracted the virus and also that Lulu would survive. Sam (Kelly Monaco) had scuba gear and prepared to jump into the water when she saw Jason (Steve Burton) surface. Mike (Max Gail) was with Stella (Vernee Watson) at Sonny’s (Maurice Benard) when he had an episode in which he thought he missed his bus home and his parents would be worried. Stella told Mike to stay the night as it was getting late. Curtis (Donnell Turner) met with Marcus at Kelly’s and they talked about Mike, Stella and Yvonne (Janet Huber). Carly (Laura Wright) was concerned for Jason as was Josslyn (Eden McCoy) since he risked his life to save her. Sam managed to pull Jason out of the water and called Carly to tell her he was okay. But Carly and Sonny knew Jason wouldn’t come to the hospital to be checked out. Jason thanked Sam for saving her life. Josslyn was relived Jason was okay as was Oscar. The teens shared a kiss. Franco (Roger Hogwarth) allowed Jake (Hudson West) and Aiden (Jason David) to stay up past their bedtime in order to make cupcakes. Aiden was happy when Franco told him he could bring the cupcakes to school along with the cookies for the bake sale. After his little brother left the room, Jake said Aiden taking the cupcakes to school wasn’t a good idea. Sam brought Jason back to the penthouse and made him something to eat. Marcus told Curtis how Stella broke their (his and Stella’s) engagement when Thomas Jr. died and added if Curtis and Thomas’ father had died a year later. Mike mistaking Josslyn for someone from his youth school days named Mary reminded Sonny that his dad’s episodes were getting worse. When Elizabeth (Rebecca Herbst) arrived home, Jake told her and Franco that Aiden shouldn’t be allowed to bring the cupcakes to school. Elizabeth thought it would help her son to be able to express himself. She commented that she thought the bullying with Charlotte (Scarlett Fernandez) was over. Jake answered that it may have started with Charlotte but is far from over. And bringing flowered-covered cupcakes to school would only make things for Aiden and cause more teasing. Then, Jake showed Franco and Elizabeth the tablet where people were calling Aiden “Gayden.” Sam told Jason how him being in the water reminded her of when she tried to save him after he was shot in 2012 and thought he died. This was a painful memory for Sam but fortunately this time had a better outcome as she was able to pull Jason out of the water. It was like Sam had been given a second chance when she saved Jason’s life this time. Sam and Jason’s emotions caused them to kiss, which soon turned passionate and they ended up in bed together and made love. Sam (Kelly Monaco) happily woke up in bed with Jason (Steve Burton). Jake (Hudson West) assured Franco (Roger Hogwarth) and Elizabeth (Rebecca Herbst) he’d keep Aiden (Jason David) online. Peter (Wes Ramsey) told Anna (Finola Hughes) she didn’t have to wait with him at the PCPD. With bandaged eyes, Ryan awaited to learn whether he’d be able to see again. He and Ava (Maura West) were surprised to learn Griffin (Matt Cohen) was “Kevin’s” doctor. 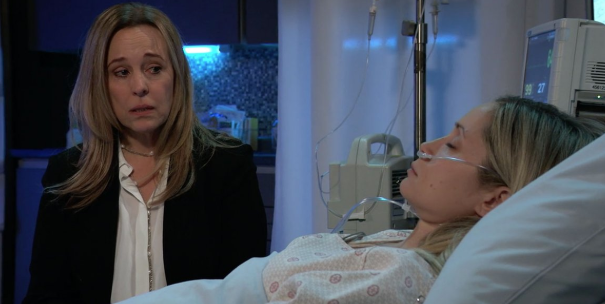 Laura (Genie Francis) sat by Lulu’s (Emme Rylan) hospital bed and urged her to wake up. Sonny entered. He offered his help by providing a reward for anyone coming forward with information. Peter was happy to see Maxie (Kirsten Storms) at the PCPD and continued to try to get Anna to leave. Jordan (Briana Henry) appeared, apologizing for keeping him waiting. Peter was annoyed when Anna followed him into the interrogation room. Jordan showed Peter the photo of the bloody footprint of the shoe style he ironically had on the police found. But because he wore a Size 12 shoe, the print didn’t match. In order to rule himself out as a suspect in Kiki’s (Hayley Erin) murder, Peter reminded Jordan that he was at her wedding and reception the whole time. Jordan asked August to wait while she reviewed the video footage. Peter told Anna she could leave. Ms. Devane asked Maxie to call her if they (meaning son Peter) needed her. Robert Scorpio (Tristan Rogers) arrived at General Hospital and told Finn (Michael Easton) he was looking for Anna because he brought the information she asked for. When his bandages were removed, Ryan could see. Griffin wanted to perform more tests before signing off on “Kevin’s” release. Ryan agreed as long as it didn’t take too long because he had pressing matters to attend to. Laura talked with Lulu and assured her daughter that she (Lulu) could wake up when she was ready. Franco asked Elizabeth how she’d feel if Aiden turned out to be gay. Liz didn’t have a problem with her son being himself. Franco however worried what Aiden would have to deal with as people could be cruel. But he said that they’d have a good ten years before they’d have to tell with the harshness if Aiden did turn out to be gay. Later, Elizabeth hugged her son and told Aiden how much she’d always love him. As Sam worried something would ruin their happiness, Jason left the penthouse for a meeting with Spinelli (Bradford Anderson) at The Metro Court. He told best friend Carly (Laura Wright) that he and Sam were back together. Carly was thrilled and couldn’t wait to tell Sonny. Sam tried not to panic when Jason forgot to text her and hadn’t returned. When he entered, Jason reminded that he said he’d be back. Ava was relieved when Griffin told her Lulu would recover as Ms. Falconieri could identify Kiki’s killer. Anna was surprised to see Robert at General Hospital. She learned that Kevin had a connection to the WSB. Lulu squeezed Laura’s hand. As the new mayor went to get a doctor, Lulu’s eyes opened just in time to see her attacker standing over her hospital bed. “Hello Lulu,” Ryan sneered. The Week In Review for #GeneralHospital I wrote from The Nerdy Girl Express.